Mary Poppins Returns has taken more than $250m since it opened just after Christmas. But apart from confirming that dancing cartoon penguins are still amusing, what message is the audience left with, once they’ve watched the brolly-brandishing nanny float away again into the blue yonder? To set the scene: Michael Banks, a boy in the first film, is now a father-of-two himself and facing the prospect of having his house repossessed unless he can repay a loan he took out, by the end of the week. 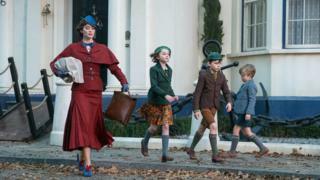 But what other money lessons can we take from the Mary Poppins films? Spoiler alert – even with a large spoonful of sugar, it’s hard to swallow the idea that investing just tuppence over 25 years could really save the day. In the 1964 original, young Michael nearly causes a run on the bank because he wants to give his pocket money to a woman selling bird food, instead of prudently investing it. The new film seems to vindicate his father’s advice to put his trust in the financial wizardry of compound interest. Michael’s tuppence investment turns out to have grown significantly between 1910 (when the first film is set) and the time of “the great slump” (when the new film is set) in 1935. A quick check with a compound interest calculator suggests looking after two pennies wouldn’t even return you a single pound after 25 years (assuming average interest rates of about 6%). If you’d been clever enough to identify the equivalent in 1910 of Apple or Microsoft, a company whose share price rocketed in its early years, suggests Mr Johnson, your tuppence might have seen significant gains. But Michael’s father famously suggested “railways in Africa, dams across the Nile”, as well as canals, shipping and tea plantations. Since the period around World War One wasn’t particularly a growth period for global infrastructure or international trade as nations grew suspicious of each other, he might have done better to focus on the new consumer goods coming onto the market such as radios, refrigerators and cars, or perhaps he might have considered oil stocks, or armaments. Even if he did though, says Mr Johnson, “whatever you’d made by 1929 you’d have lost by 1930.” The bank would have had to foresee the Wall Street crash and shift Michael’s nest egg into something ultra-safe like gold in good time. Would the Banks’ bankers have been smart enough to spot the Apple or Microsoft of their day? Matthew Partridge, economist and senior writer at Moneyweek, says the only way realistically they could have saved enough to rescue the house is if they’d put in more capital or saved for longer. But Mr Partridge prefers to take a step back from the nitty-gritty details and to take a more positive lesson from the film. One other thing to bear in mind: while the original film is set in 1910, it was made just as the Sixties swung into gear, leaving the post-World War Two years of austerity far behind. So perhaps it is not surprising the original film’s message was about lightening up a bit. And if that 1960s audience had opted to save their pocket money, points out Paul Johnson of the IFS, it would have stood them in very good stead since the stock market has performed extremely well in the 50 years since then, one reason the baby boomer generation has done so well. That doesn’t mean it still holds true. “Now, saving is not [worth] a great deal,” says Mr Johnson. Interest rates are so low it’s almost impossible to save enough for your retirement, he reckons. So what would be a better take-home message for today’s generation?